St. Petersburg has surpassed Moscow for the first time in a major international ranking of financial competitiveness. Regional authorities say it comes down to a concerted effort to attract foreign investment. St. Petersburg, Russia’s second-largest city, has overtaken Moscow in a global rating of financial competitiveness known as the Global Financial Centers Index (GFCI), compiled by the London-based consultancy Z/Yen Group. According to the report published in September, St. Petersburg jumped six places in the ranking to 72. Moscow fell to 80th place. The global leaders were New York, London, Hong Kong, Singapore, and San Francisco. The cities were judged according to their business environment, financial sector development, infrastructure, and human capital, as well as their reputations. St. Petersburg took the lead in part due to its role as a center for foreign investment. In addition, St. Petersburg adopted a new strategy in 2014 that facilitates a substantial increase in foreign investment. Regional authorities attributed the improvement to the city’s ability to attract foreign investors, who have channeled money into manufacturing. The St. Petersburg authorities offer major concessions to investors who show interest in the region. In 2013, St. Petersburg’s foreign trade turnover totaled $54 billion, with 193 country trading partners. Its trade with the United States alone grew 8.2 percent to $1.6 billion, even though the U.S. is only the city’s 11th-largest trading partner. Nevertheless, imports from the U.S. ($311.6 million) were roughly one-fourth the value of exports ($1.3 billion). St. Petersburg’s main offering to American consumers is mineral fuel, which accounts for 23 percent of the city’s exports. It also exports wood, fur, and optical instruments. In turn, the U.S. primarily delivers meat and meat products, nuclear reactors, ground transport, electronic equipment, and other items to St. Petersburg. In particular, regional officials have promised to introduce a tax break on land for companies and tax breaks for IT companies and players in the tourism market. St. Petersburg’s labor productivity in manufacturing tops $80,000 per employee as measured by purchasing power parity for the ruble to the dollar, compared to the $36,000 average for Russia as a whole, according to the city administration’s press service. However, this figure is still two to three times lower than the average for developed countries. 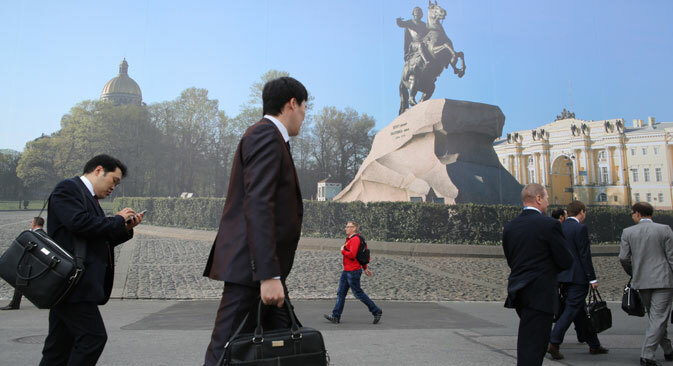 St. Petersburg can narrow that gap by attracting foreign investors, the administration said. As a result of its new strategy, St. Petersburg is slated to boost the share of production in the hi-tech and knowledge-based industries to 20 percent of gross regional product by 2019. Fixed capital investment will grow to 70 percent of that figure. At the moment, more than 730 small- and medium-sized enterprises, among them some of the largest companies in Russia, make up the basis of St. Petersburg’s industry. There are 22,000 small enterprises involved in the manufacturing sector. St. Petersburg is also one of Russia’s leaders in the cluster policy for industrial development. St. Petersburg is among Russia’s three largest innovation centers and among the top 100 in the world, according to the Innovation Cities Global Ranking. The northern city boasts great human resources and intellectual potential, with more than 320 scientific organizations and over 90 Russian universities. St. Petersburg is creating special infrastructure – for example, the Ingriya and Kristall business incubators – with an eye to developing its innovation potential. According to the St. Petersburg Administration, American companies were the pioneers behind the development of the city’s auto industry. At the moment, Jonson Controls and Tenneco have a presence on the city’s market, and General Motors is one of the biggest investors in the St. Petersburg economy. Ford has a large auto factory not far from the city. In 2013, U.S. investment in the St. Petersburg economy totaled $116 million. As a whole, $471 million in American investment has accumulated in the city’s economy. Compare that to $13.4 billion in combined foreign investment in the city in 2013, as well as $25.4 billion of accumulated foreign capital. St. Petersburg annually hosts major international conferences, including the St. Petersburg International Economic Forum, the St. Petersburg International Innovation Forum, the St. Petersburg International Cultural Forum, and others. Economic and political observers predict a rise in the city’s international profile, partially due to the World Hockey Championship matches scheduled to be held there in 2016, and also because of the FIFA World Championship matches scheduled there for 2018.